Mesh mounted random strip mosaics, coordinating with both colour of the series. The Merola Tile Hudson Penny Round Vermilio 12-inch x 12-5/8-inch x 5 mm Porcelain Mosaic Tile has a distinctive salmon glaze with a high-gloss sheen. Its unique shade will add a warm touch to your showers, backsplashes, bathrooms and light duty floors. Impervious, frost-resistant and easy to clean, this tile is a perfect choice on its own, coordinated with other colors in our Penny Round series or cut into strips for accent applications. Convey enduring class and depth on floors, walls and backsplashes with the Merola Tile Metro Dog Bone Basket Weave Matte White & Black 10-1/2-inch x 10-1/2-inch x 5mm Porcelain Mosaic. The retro configuration is comprised of an impeccable balance of uniform glossy and matte glazes, offering a dimensional look. Matte white chips are accentuated by the small glossy black squares that provide the woven illusion. The basket weave design of the mosaic brings charisma to any space that you install them. An impervious water absorption rating makes this slip and stain-resistant porcelain tile a great ADA-compliant choice for both indoor and outdoor projects.If pairing with other products in our Metro Metro Dog Bone Basketseries, please consider that all formats and thicknesses may not be the same. The Merola Tile Metro Hex Glossy White w Heavy Flower 10-1/4-inch x 11-3/4-inch x 5mm Porcelain Mosaic has a smooth, glossy sheen and adds a classic vintage charm to your decor. The black flower pattern provides a stark contrast to break up the uniformity of the white glazed pieces. This hardy, easy-to-clean tile is frost resistant- you can use it for your light-traffic spaces whether they're indoors or out.If pairing with other products in our Metro Hex series, please consider that all formats and thicknesses may not be the same. 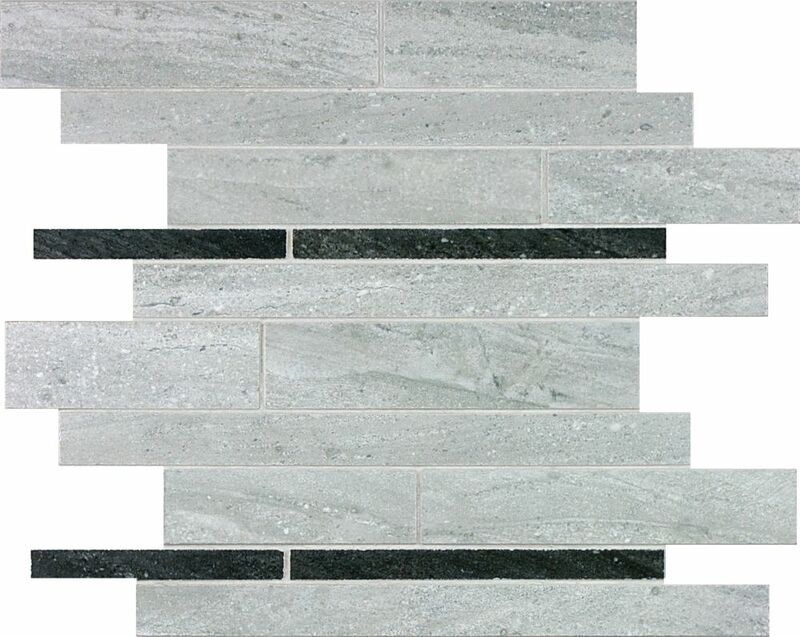 The Merola Tile Rustica Brick Highlands 10-3/4-inch x 12-3/4-inch x 8 mm Porcelain Mosaic Tile is imported from Japan. Lush browns, shimmery blacks and striated sandy blends of peach and tan recall the stark beauty of the Saharan highlands. Every brick deviates from the other in color and texture because of its reactive glaze, ensuring that your installation will be unlike any other. For use indoors and out, it works well as a rugged field tile or cut into strips for floors and walls in kitchens, showers, bathrooms, and backsplashes. Fragment Strip Porcelain Mosaic Mesh mounted random strip mosaics, coordinating with both colour of the series.